We've spent the past few weeks clearing out our office for its upcoming renovation, and we quickly realized that we'd accumulated a lot of vintage space-age plastic items since the last related update. We figured we may as well photograph these now, as they're likely to be in storage (elsewhere in our home) for the foreseeable future. Not even sure how long some of these have been kickin' 'round the house but, without further ado, fix yer spinning orbitals on the following! 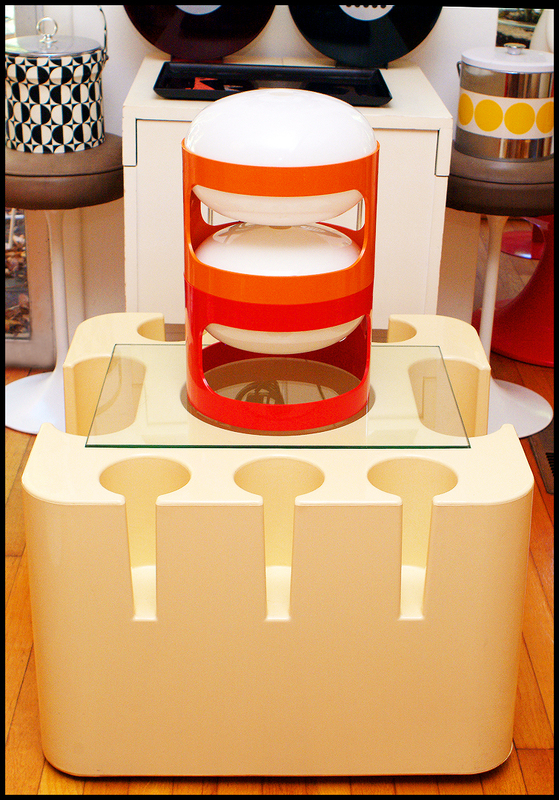 A white Artemide Giano Giano Vano side table designed by Emma Gismondi Schweinberger in 1966 is a semi-recent arrival, as are the large, vintage orange Componibili storage units designed by Anna Castelli Ferrieri for Kartell (thanks again, Marc!). Ferrieri was also responsible for the tall white domed container (also for Kartell) we discovered for $2 at a thrift store in a remote part of Georgia. Another Kartell product is the yellow Gino Colombini designed wastebasket Valery turned up at a local flea market. 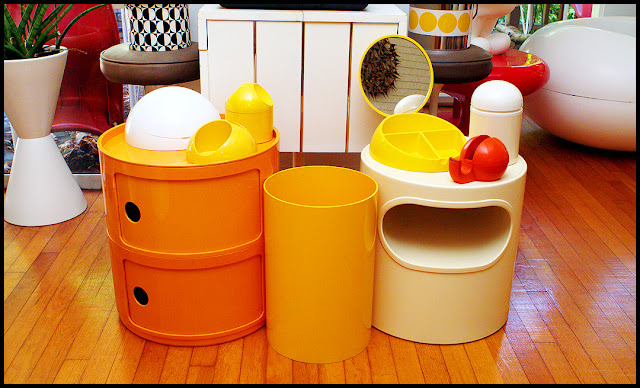 Japanese designer Makio Hasuike created the miscellaneous bathroom containers for Italian company, Gedy, in the 70s. Lastly, we're not sure who designed the space age tape dispenser pictured above, but a sticker indicates that it's from Italy as well. 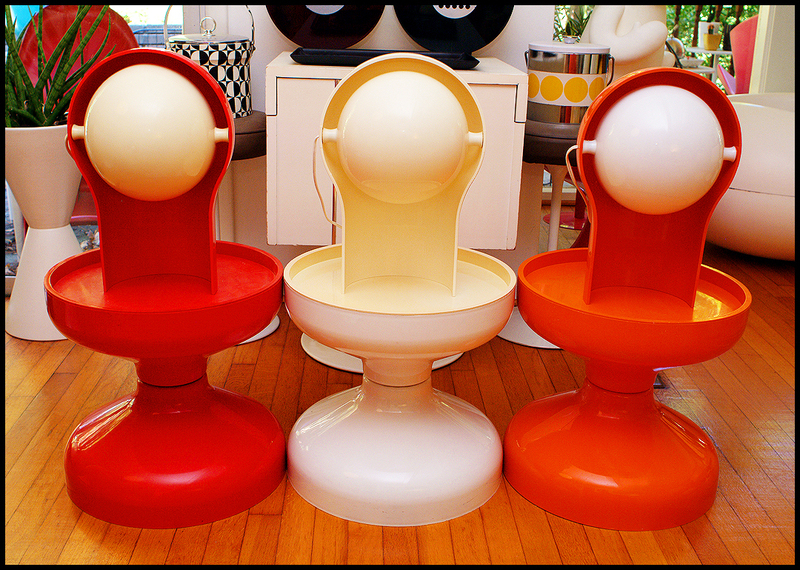 It seems as though we really can't get enough Kartell products. 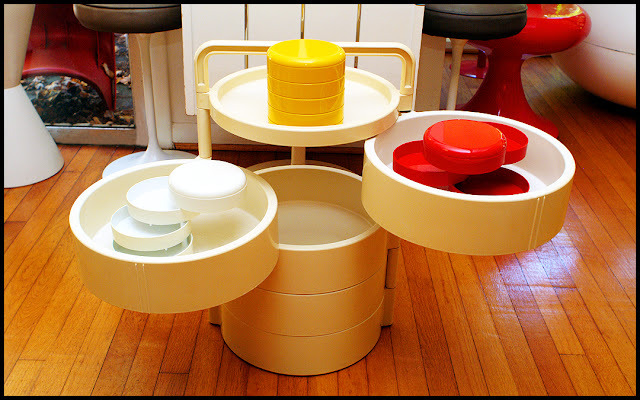 Here's a round trolley cart designed by Franco Anonni that we purchased from our Instagram buddy Melissa. Thanks again! We've also had great luck turning up these Italian desk caddies designed by Rino Pirovano for Rexite in 1970. Thanks again to Danny for the white one! Danny was also kind enough to hook us up with a white Telegono lamp designed by Vico Magistretti and produced by Artemide in 1967. We lucked out and found an orange example buried in the internet's depths a few weeks later. 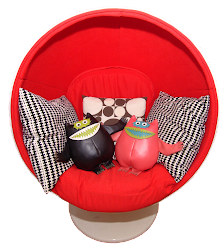 Lastly, our buddy Amy sold us her red version, successfully rounding out the trio! Amy also kicked down her old Bacco bar, designed by Sergio Mazza and, again, produced by Artemide in 1967! Thank you so much, Amy, we love it! 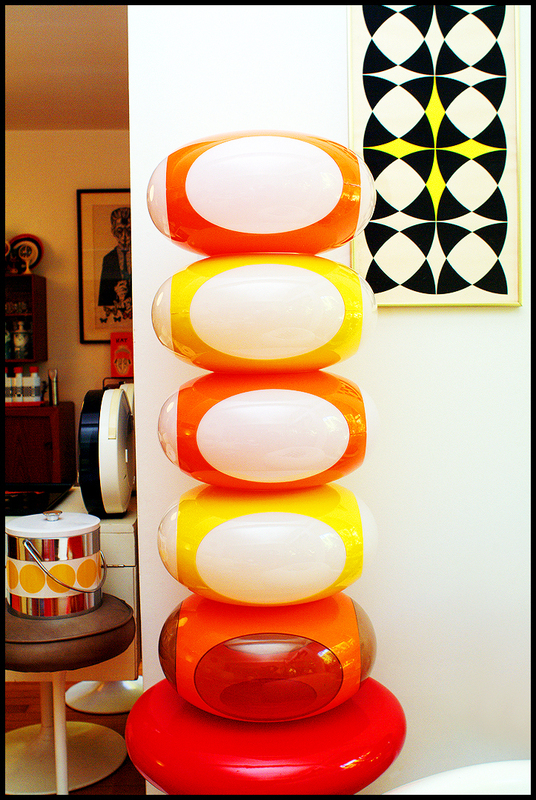 Our buddy Marc also came to our aid (again) by purchasing an orange Kartell KD27 lamp (designed by Joe Colombo) from a dealer in Germany and shipping it to us. Coincidentally, a week later, we discovered a red KD27 on Atlanta's Craigslist and purchased it in person! 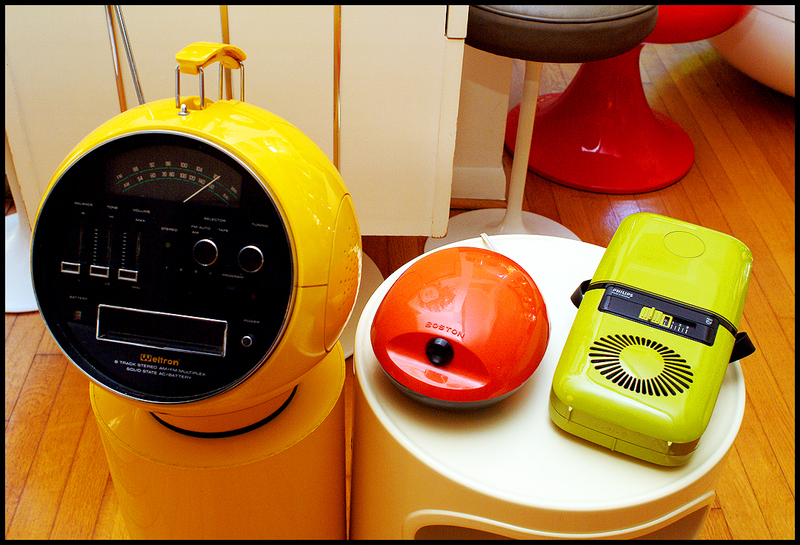 Now, if someone could just help us locate a yellow one, we'll be all set! Here are a few more plastic items that require electrical power! A yellow Weltron 8 track player in pristine condition, an orange Boston pencil sharpener and a green Philips compact floating hairdryer. 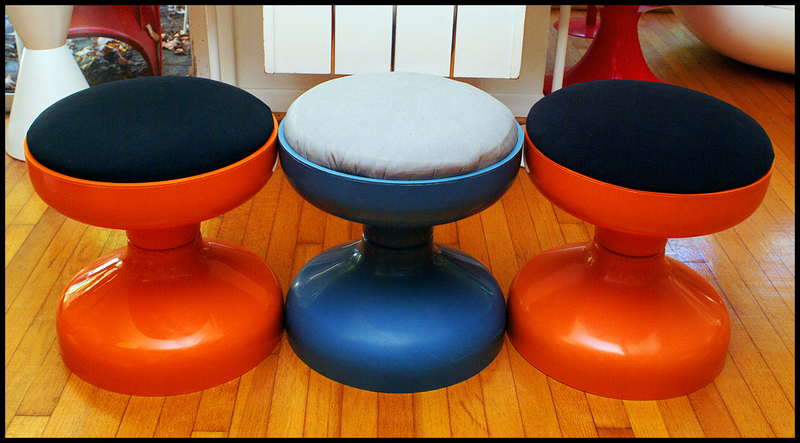 Astute GG&S readers will have no doubt noticed that we had an orange Kartell Rocchetto stool (designed by brothers Pier Giacomo and Achille Castiglioni) featured above. Many thanks are due to Trish, Martin, Damian, Maddie and Lady Frito Lay for their help in getting this pair from Melbourne to Atlanta (by way of Chicago). It may have taken over a year to accomplish, but it was well worth it! We're also grateful to our buddy Zack who stumbled across the blue specimen featured above! These three will all end up in the office once it's done. At least four of these vintage space-age light fixtures will also end up providing some much-needed illumination in our upcoming project. Despite the fact that these are regularly attributed to Luigi Colani, we're skeptical about the connection. Still, we love 'em and we were overjoyed when we bought four mint ones from a dealer right here in the states ...and for cheap! The fixture with clear panels came from our buddy Darrell and will end up in our master bathroom. 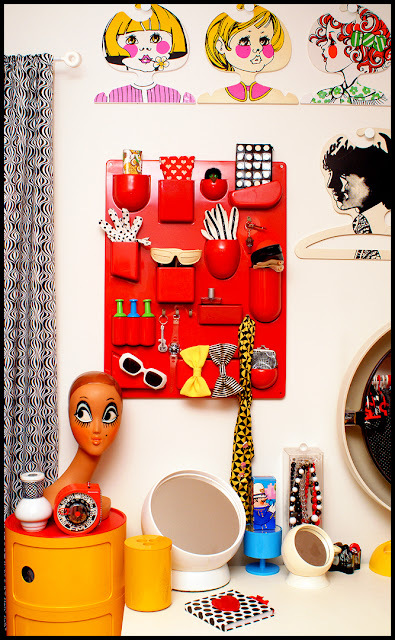 Well, we thought this update was over, until we remembered that we had actually picked up a vintage, red example of Dorothee Becker's Utensilo (that replaced the white one in Valery's dressing room). Our office will feature joint work stations, so it's likely that the previous one will end up in Valery's area. OK, that's really it for now! Whew!! You've put together an incredible collection. Well done! I'm going to have to go back and look at each picture more closely. Don't you just love it when you find something like this in an unlikely place? My daughter and SIL found a vintage Joe Colombo Boby cart at an estate sale for $1 and then found another one soon after that for just $5! yer blowin my mind right outta my skull!!! Thanks to both of you--we were out of town, so apologies for the late response! Sounds like some good scores, Dana! We only have one bobby cart and we've never lucked out with another one in the wild.